Ever wanted to know what your air intake is doing? Now you can check it out while it is sealed tightly behind transparent polycarbonate and machined billet aluminum. 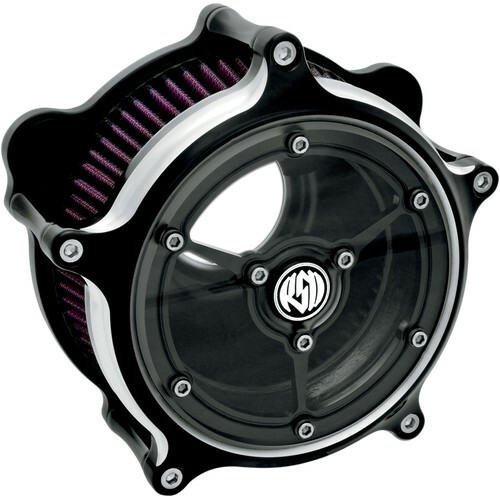 RSD Clarity Air Cleaner exposes your fuel delivery system as no other intake system can. This RSD air cleaner in Black Ops looks wicked on my Softail Slim S. The clear window into the throttle body is a very cool concept. Much smaller than the factory 110 cover, it really makes the bike stand out. Now I just need the cam cover to match! Such a cool assembly. Everyone is checking out my bike when I pull into bike night! The clarity window itself is permanently affixed to the air cleaner's chassis and is not to be removed. The best way to clean the window would be to disassemble the air cleaner, or rather - remove the outermost plate. Once you've done that, just use a Lexan-safe type cleaner to wipe it clean. Re-assemble and you should be all set!